The world of sport is filled with great names. Only a very select few of these come to dominate their chosen discipline and earn the title of legend. These giants are loved, feared and admired in equal measure. They transcend their entire sport, almost singlehandedly and leave a lasting impression. Muhammed Ali in boxing, Usain Bolt in athletics, Michael Jordan in basketball. And in the world of judo, Teddy Riner holds the title of king. A true judo legend, the two-time Olympic gold medallist and eight-time World champion inspires awe and strikes fear into the heart of his opponents. He rules the over 100 kilogram division. The Frenchman arrived in Budapest on day six after an entire year off the tatami. He faced the young Georgian and pretender to the throne in the over 100 kilogram throne, Guram Tushishvili, the reigning European champion in the semi-final. It was a battle of the energy of youth versus experience. With no shidos throughout, it came down to Golden Score and in the end, the Frenchman won. A triumphant Riner then marched on to a showdown with Brazilian and current world number one David Moura. His task was to defeat the legend and make history. But it was not his day and the king was in no mood to be denied. 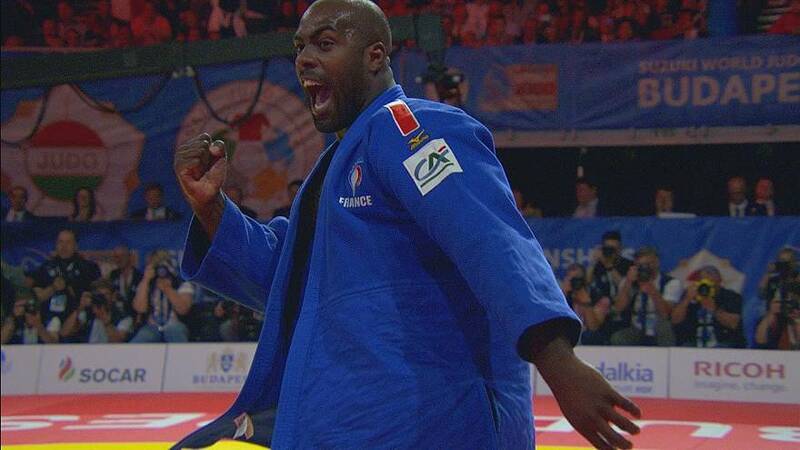 Teddy Riner recaptured his crown in Golden Score in magnificent style. The men’s under 100kg category pitted the might of Japan, seeking another gold medal, against Georgia, looking for their first title. The Japanese world number 31 Aaron Wolf battled Varlam Lipartelliani, the Georgian Olympic silver medallist in Rio. Ahead by two shidos against the Japanese, Georgia seemed on track but Wolf turned the tables in Golden Score with a superb waza-ari to take the world title and bring Japan’s medal tally to seven. Our guest today in the VIP corner was Lord Sebastian Coe, two-time Olympic gold medallist in the 1,500 metre event and current President of the International Athletics Federation. Today’s moment of the day came courtesy of Georgia’s Guram Tushishvili. The big man scored ippon against Cuba’s Álex García Mendoza in the quarterfinals of the men’s over 100 kilogram category after only five seconds.